Whether its very bushy eyebrows, very long eyebrow hair, uneven eyebrows, or even not enough eyebrow hair, there is something that can be done to make an improvement. Contact Adelaides Brow Guru. 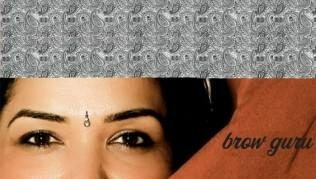 I'm a brow artist known for my eyebrow shaping/eyebrow sculpting skills in Adelaide (with threading 'n' more). I promise to make you feel better about your eyebrows with my customised blend of eyebrow threading, plucking and trimming (from my studio - in Norwood). 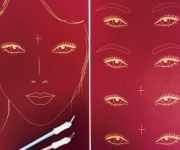 I was privileged to bring eyebrow threading to Adelaide CBD and have made it synonymous with good eyebrow sculpting and now only work from my Norwood based home studio. I have taken eyebrow threading to another level, I don't just clean up your eyebrows using threading (which for one is the best technique in the world), I customise my personal blend of threading, plucking and trimming according to your hair growth and skin type for the best result. I sculpt your brows into their best shape because I have a gift for doing that. When a colleague at Estee Lauder called me the 'brow guru' introducing me to a client, the name sort of stuck. I am a make up artist and I understand facial lines, structure and beauty. They also call me 'Brow Nazi' because I can be extremely fussy in trying to shape the brows and expecting people not to damage their eyebrows. I have been doing eyebrow shaping for 14 years now and see smiles (and sometimes tears of joy) on faces after people trust me with their brows and most people go - 'Wow'. I now also offer eyebrow tattooing after completing a CT-AIVEP advanced eyebrow course using the Amiea Linelle Supreme.